THE idea of wearing a slide on the scarf has become very popular among Scouts who have been quick to imitate the fashion set by the 1st Gilwell Park Troop. 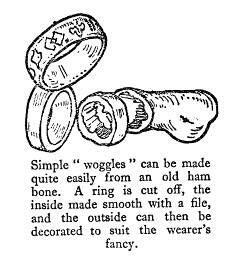 It is certainly far too good an idea to be confined to any one troop, and although the leather Turk’s Head ring is only worn officially with the now well-known Gilwell scarf there are other varieties of woggles which Scouts may wear. I am going to hand on to you a few ways of making scarf slides which I have come across. A very keen Scout friend of mine who calls himself the “Lynx,” made a ripping scarf ring out of an old ham bone. The first illustration shows you how this is done. Just saw off a ring of bone, smooth down the inside with a file, and then ornament the outside to please your own particular fancy. The “Lynx” carved a lynx’s face on his ring looking most fierce with bristling whiskers, and you might well adopt that idea – carving the head of your trol Pa animal or bird on the front of the ring. This you will find is not so easy to do in bone, but the same idea can be applied to wood, which is easier to carve and brand. 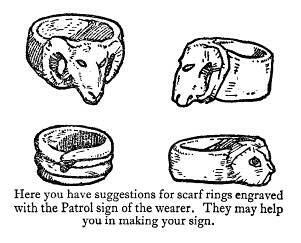 You see in the next picture suggestions for scarf rings for the Ram or Giddy Goat Patrol, and also for the Owls and Rattlesnakes. Probably you will be able to work out your own Patrol sign from these ideas. If you are making a wooden scarf ring don’t choose wood which splits easily. Remember also to bore out the wood from the middle of the ring before you get the outside whittled down too thin, or you might find all your labour wasted by splitting it when you bore the middle away. Perhaps the simplest type of scarf slide is one made from a small piece of leather strap just bent round into a ring and sewn at the join. This type can be made to look very attractive if embossed with a Scouty design after first soaking the leather to get it soft. 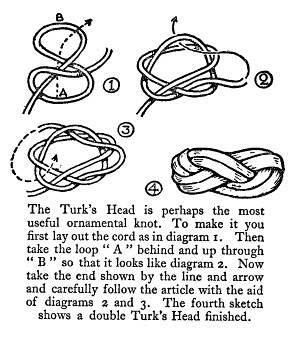 This article would not be complete without a description of the Turk’s Head, for though you cannot officially wear the leather, two-strand pattern of the 1st Gilwell Park Troop, there is no real reason why you should not make similar slides in coloured cord or other material; and, anyway, every Scout should know how to make a Turk’s Head, for it is perhaps the most useful of all ornamental knots. You will often find it decorating the tiller of a barge, manned by a bargee who takes a pride in his craft, or it is frequently worked into lanyards and other fancy work by sailors. There are several ways of working this attractive knot. See if you can work it out on this plan with the aid of the diagrams. First lay out the cord like diagram 1. Then take a loop – A – behind and up through the loop B in the direction shown by the arrow. It should then look like diagram 2. The line and arrow show you the next move, which is simply to put the right-hand end over the next strand to it and then under the next one. Having done this, you put the same end down over the next strand to it, and then up alongside the other end. Then having thus got the two ends together, you simply follow round as many times as need be, keeping the strands side by side. When the Turk’s Head is as big as you want it to be, either double like the illustration, treble, or quadruple, cut the ends off so that they just meet, bore a hole through each end and join them up together with a piece of thin wire, or in the case of cord just sew them strongly together. I hope that you will not exactly copy these patterns but try and invent something for yourself. If you could get a sailor friend to show you how to make a pineapple – which is something like a Turk’s Head but much more elaborate – you could make a really beautiful “woggle” for your scarf. This page was last edited on 9 January 2011, at 19:04.